Warehouse quality racking for your garage. Store your garage essentials securely with easy to assemble garage shelving from our Monster Racking range here at MonsterShop. Our Monster Racking storage systems offer excellent value for money and outstanding quality, with a key lock mechanism to make assembly quick, easy and 100% boltless. Our T-Rax shelving range is completely unique to MonsterShop and can handle an incredible 280kg of evenly distributed weight per shelf. Each T-Rax shelving unit is constructed using 1.2mm steel (much tougher than the 0.8mm industry standard) and features thick MDF boards and four layers of durable paint to keep each unit looking perfect, for longer. Our Q-Rax shelving features deeper than industry standard depth and robust, sturdy construction, offering a freestanding garage solution you can rely on. Available in a host of sizes to suit your space limitations, our Monster Racking Q-Rax, S-Rax, Z-Rax and T-Rax shelving bays are perfect solutions to your home storage problems. 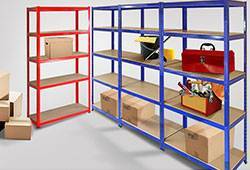 Need shelving for your garage in a hurry? You can pick up our Monster Racking storage shelves direct from our MonsterShop warehouse in York, North Yorkshire.